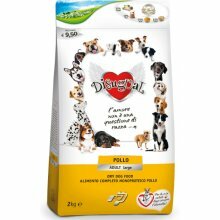 Complete monoprotein food with chicken for large dogs. Specifically formulated to sustain large dogs’ bone structure and to maintain the correct lean/fat body mass balance. Chicken is a white, lean meat that is rich in noble proteins for optimal digestion and assimilation. A change of diet must be done gradually over a period of maximum seven days. 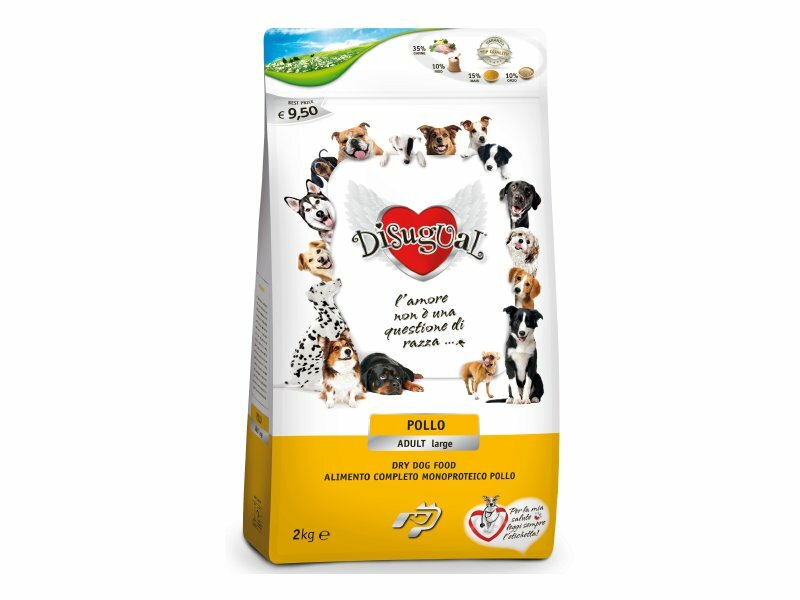 Feed your dog two meals a day in accordance with the recommended daily allowance. Adjust the amount according to your dog’s age, natural disposition and activity level. Always provide a supply of fresh water. Dried chicken meat (20%), fresh chicken meat (15%), maize (15%), rice (10%), barley (10%), purified animal fats, beet pulp, hydrolysed chicken liver, brewer’s yeast, minerals, fish oil, chicory (FOS), mannan oligosaccharides, citrus fruit extract (rich in bioflavonoids), yucca extract, glucosamine, chondroitin sulphate.